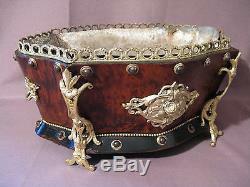 Former planter Napoleon III mahogany and bronze in very good condition. The zinc tray is welded in places (see red arrows) but the bottom is not pierced. For this object we manufacture a body in stirodur to see two last photos. Click once on the images, then 1 second time to zoom. The item "antique bronze and mahogany period Napoleon III iii nineteenth century" is on sale since Monday, December 5, 2016. It is in the category "art, antiques \ furniture, decoration xix \ decorative objects". The seller is "goutaury" and is located in / floirac. This item can be delivered anywhere in the world.